The Ladykillers demonstrates how well the English can make murder into one of the genteel pursuits of life. It was the last film to be made at the old Ealing studios before Michael Balcon was given his marching orders and television moved into that seedbed of post-war British comedies. The film therefore stands like their monument. A little old lady lets an upstairs room to an oddly mixed group of 'musicians'. They comprise a bogus major (Cecil Parker), a dumb bruiser (Danny Green), a heavy type (Herbert Lom), a lively spiv (Peter Sellers) and their slightly demented-looking leader (Alec Guinness). They are in fact crooks, intent on a robbery nearby. They get the money - but it's their frail landlady who ends up keeping it, as fate and the mechanics of Ealing comedy proceed to eliminate the gang one by one. You could call The Ladykillers a black comedy were it not for the rose-tinted performance of Katie Johnson who, at 77, was coaxed out of retirement after a series of small parts in earlier movies to play the redoubtable Mrs. Wilberforce. Ealing films always had a hankering after the blessed certainties of the Victorian past and in Katie Johnson's performance, which confronts the crooks with the sort of gentility that acts as a lie detector on the guilty lodgers, all the Ealing virtues are displayed as solid as a Victorian public building. Her scenes with Alec Guinness are particularly memorable - for Guinness was likewise inspired by the freshness of William Rose's script and the nuances of Alexander Mackendrick's direction to devise a character who walks along the tightrope of mania, turning in an instant from the urbane to the sinister and transforming his face into a leer of border-line insanity at the slightest provocation. Many critics in 1955 thought Guinness had never given a finer comic performance. Despite the grisly deaths, nothing in The Ladykillers interferes with the reassuring moral that goodness will triumph over evil, just as a nanny figure like Mrs. Wilberforce will always prevail over her unruly brood of naughty boys. 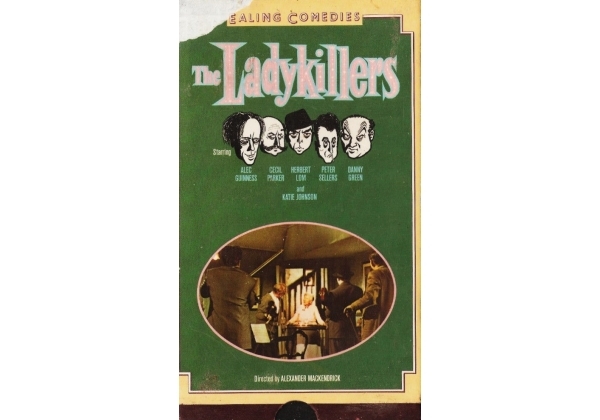 Or find "Ladykillers, The (1955)" on VHS and DVD / BluRay at Amazon.